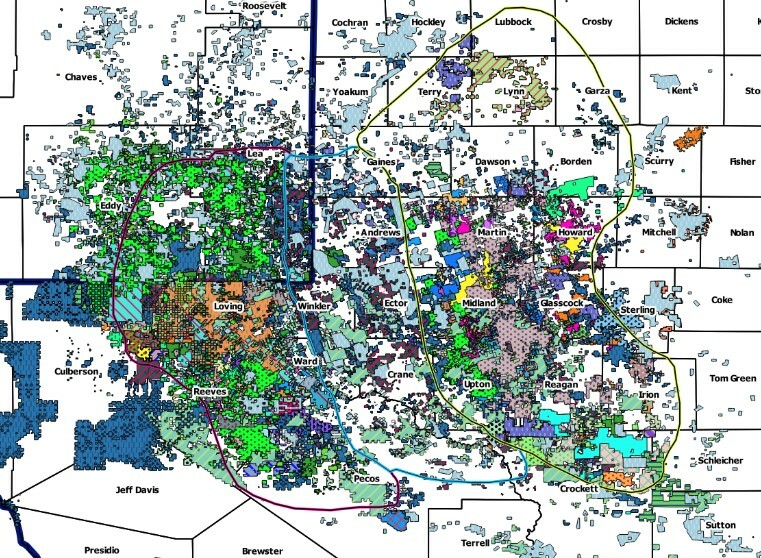 THE PERMIAN BASIN “WILL PROBABLY BECOME THE WORLD’S LARGEST OIL PATCH,” says Bloomberg, drawing from research of the U.S. Energy Information Administration. If someone asks that basic Wall Street question in Fort Worth or Midland, “WHERE’S THE NEW MONEY BEING MADE?” the answer is quick and simple for those who know what is going on in West Texas and Southeast New Mexico. Just look at the pink area, the Permian Basin, on the map. This area, a long-proven oil and gas area, is seeing production multiplied by new drilling methods, technology and equipment. Towns and cities in this area are awash in new business. High-paying jobs with huge sums of money are flowing in. And if trend studies are correct, this area will in the next few years be the world’s largest and most valuable oil field. An entire new generation of “new wealth” is already in the making. Houston-based Phillips 66 Partners said April 24 it will build the Gray Oak Pipeline to carry crude oil from the Permian Basin to the Texas Gulf Coast. The pipeline will be owned by Gray Oak Pipeline, a joint venture of Phillips 66 Partners (75 percent) and Andeavor (25 percent). Originating stations will be constructed in Crane, Loving, Reeves and Winkler in West Texas as well as in Eagle, Ford and Shale in South Texas. The pipeline will deliver crude oil to Corpus Christi and the Freeport/Sweeny markets. In Corpus Christi, Gray Oak will connect to a new joint venture marine terminal under development by Buckeye Partners. Jeff Woodbury, vice president of investor relations at Exxon, told reporters April 27 that the higher rig count and better efficiency in well completion rates will help grow Permian production in the second half of 2018, but Permian growth will at best offset declines elsewhere. Most production and drilling locations marked. Texas and New Mexico have a large number of active drilling rigs. Texas and the U.S. added oil and gas rigs in the past week, but it was without help from the Permian Basin. According to the Baker Hughes report of April 27, the Permian Basin (452 rigs) in West Texas and the Eagle Ford Shale (75) in South Texas were down one rig each from the previous week. But Texas was up four to 513 rigs, and the U.S. was up eight to 1,021. This time a year ago, there were 342 rigs in the Permian Basin, 83 in the Eagle Ford, 437 in Texas, with 870 in the United States. Baker Hughes said there were 87 active rigs in New Mexico – down three in the past week and up 32 in the past year. It remains the No. 3 state in active rigs. Three of the top four counties in the Permian Basin lost rigs in the past week. Reeves was down one to 66, Midland was down two to 51, Lea, N.M., was unchanged at 47, and Eddy, N.M., was down two to 38. 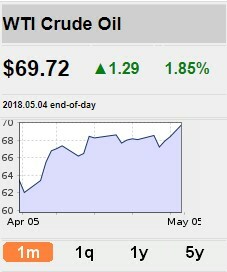 Rig counts as of April 27 in the other top regions were Cana Woodford with 70 (61 a week ago, 55 a year ago), Williston with 56 (53 a week ago, 44 a year ago), Marcellus with 54 (55 a week ago, 46 a year ago) and Haynesville with 53 (52 a week ago, 38 a year ago). Rig counts as of April 27 in the other top states were Oklahoma runner-up with 133 (127 a week ago, 127 a year ago), Louisiana fourth with 60 (58 a week ago, 58 a year ago) and North Dakota with 55 (52 a week ago, 44 a year ago).